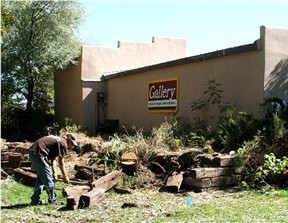 The first task was to get rid of the old rotting railroad ties. 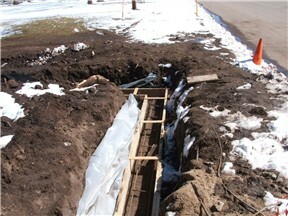 After a trench was excavated, a footing was prepared. 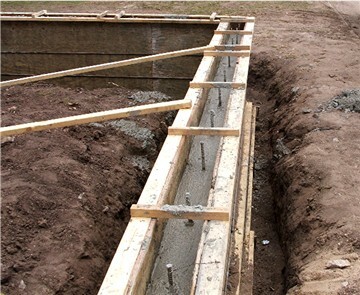 After the footing was set, the concrete foundation was poured. 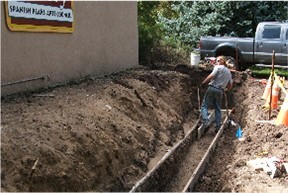 The sewer line was not where it was expected to be and as a result, it was damaged during the excavation. 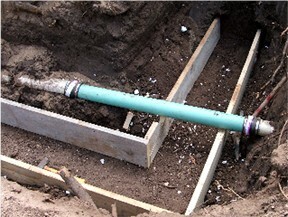 Here is the patched up pipe. 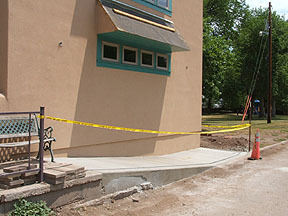 A new pipe will be installed at a better location. 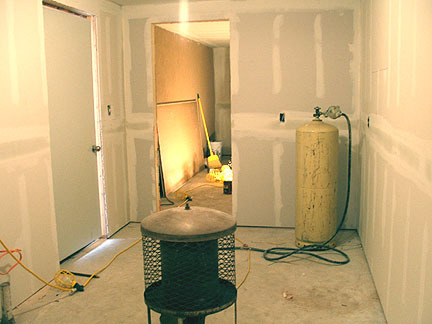 A plumber installed all the necessary pipes, since the bathroom and kitchen sink will be in this new addition. 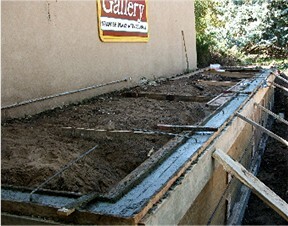 Finally the concrete was poured, covering up all the plumbing. 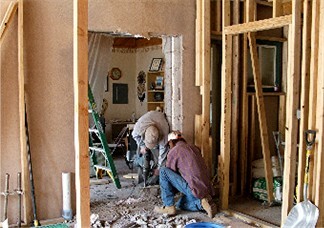 After over a week of nothing happening, finally a hole is cut in the back wall of the gallery for a doorway. 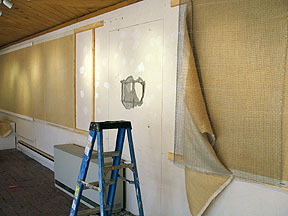 The burlap and hardware cloth beneath the burlap was rolled back. 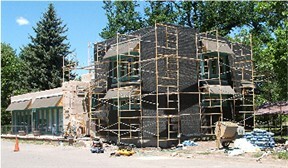 On the back side of the building, a worker cut away the cement blocks. 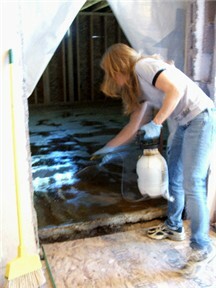 After the hole for the door was cut, plastic was installed to keep the dust out. 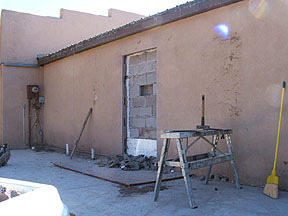 A temporary door was installed to keep the weather outside where it belongs! 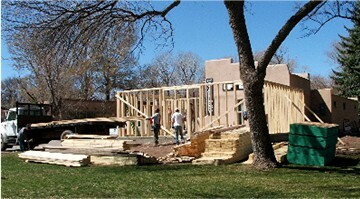 Preparations are made to begin framing the new walls. 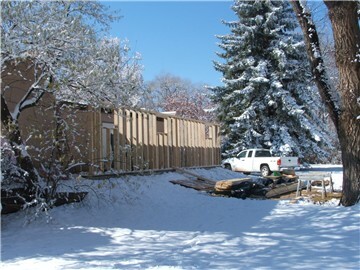 Our first snow of the season and guess what, the framing began! 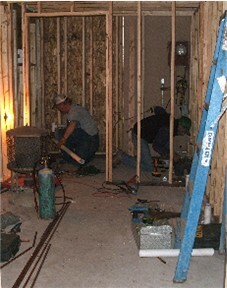 Here are two plumbers working on the new bathroom. 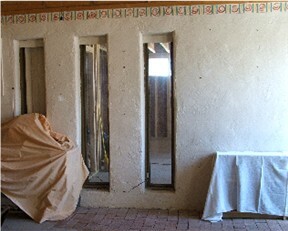 Just a few days before the Holiday Art Feast progressive dinner, the walls were put up. 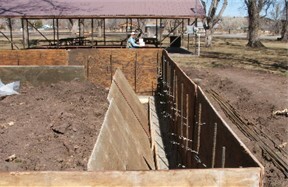 This is looking toward the storage area. 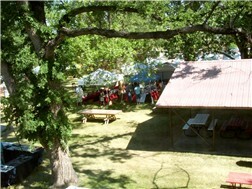 This area became the serving area for the Progressive Dinner. 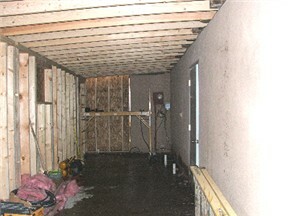 This is looking toward where the bathroom will be, from the storage area. The electrical outlets were in working order after an intensive effort by the construction crew Friday, Dec. 3.The electrical outlets were in working order after an intensive effort by the construction crew Friday, Dec. 3. 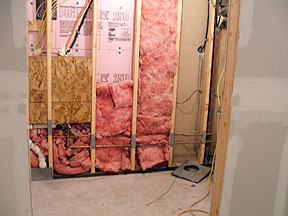 A closer look at the uncovered wall of the bathroom, where much electrical wiring was re-arranged. 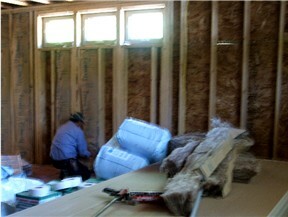 Our contractor has been able to save expenses with insulation recycled from another project. 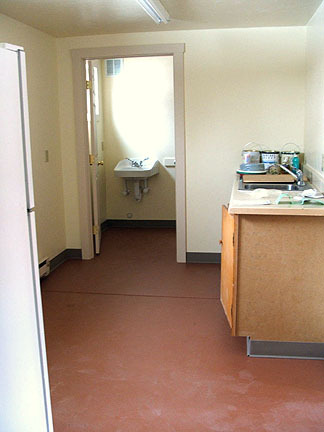 The concrete floor painted and the room is ready to use. Finally! A REAL bathroom with a heater and a window. 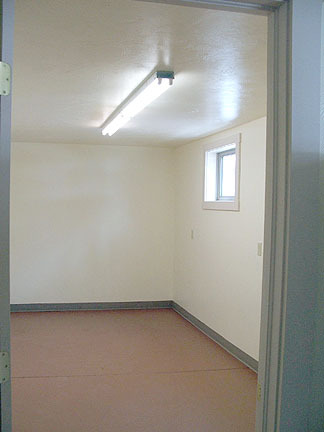 The empty storage area, soon to be filled. 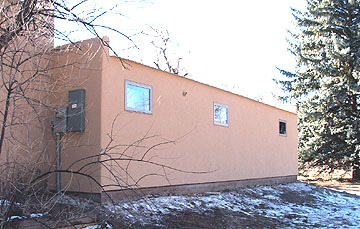 Stucco finish on the outside of the new addition. 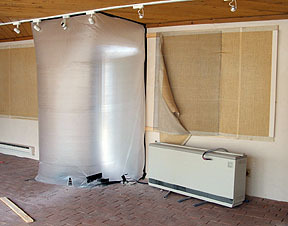 Inside the gallery, the closet has been removed, gaining additional display area. 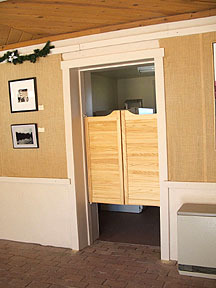 The new door from the gallery to the utility area and bathroom. 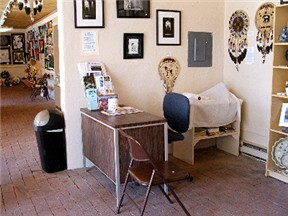 More display area in the gift shop, with the removal of the sink. 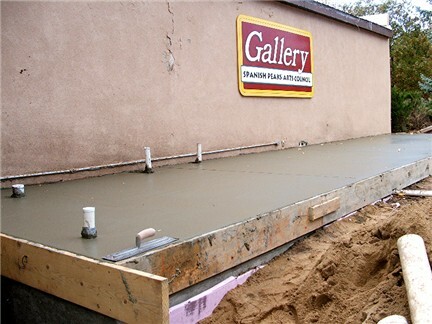 The trees and shrubs were cleared out, dirt filled in and now the next step is pouring the cement for the concrete floor for the new gallery. March 30. First phase of construction-2010 Groundbreaking on the first phase of the building expansion was celebrated on Oct.4, 2010. 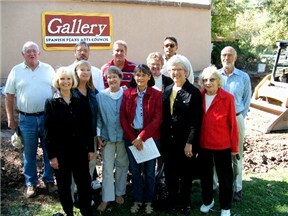 Present for the event left to right were Town Board member Jim Fowler, current Cuchara Hermosa President Paula Berg, SPACe Board Member Carole Kramer, Fuller Western Real Estate representative Paul Machmuller, Volunteer and donor Deb Donovan, La Veta Mayor Don Keairns, SPACe President Kathy Hill, SPACe Vice President Ann Gethen, Petroglyph sponsor Tom Melland, former Cuchara Hermosa President Kathie Amato, SPACe Sec/Treas. Bonnie Geppert and SPACe fundraiser John Manos. 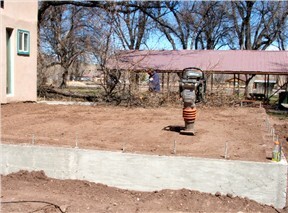 After a delay due to a snowstorm, the concrete slab was finally poured. 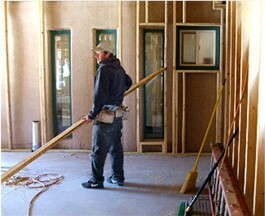 Workers are smoothing what will be the floor of the new gallery. 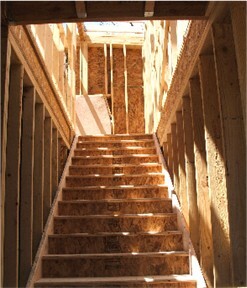 There will be a staircase to the upper level at the north end of the addition. 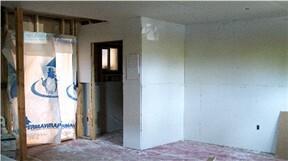 The office equipment will be located between the existing small square window and under the stairs. 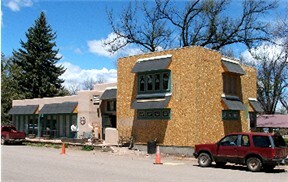 Two of the vertical windows will be removed to create the entrance from the gift shop to the new Fuller Gallery. April 6. 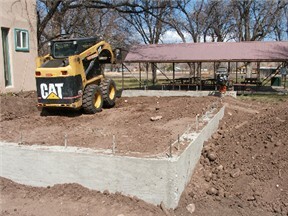 Construction on the two story addition has begun. In spite of the wintry appearance, we've had several warm spring like days. 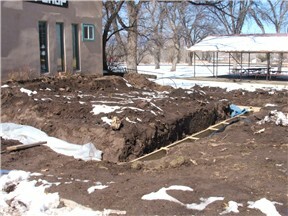 March 16--Watch the grass turn green! 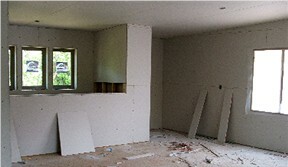 Here is where the office equipment will be, the wall that will hide the stairs is roughed in. 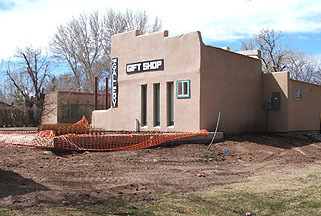 The small window will remain so the office staff person can view the gift shop. 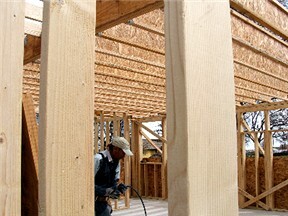 The work continues, as the weather is perfect. April 12. 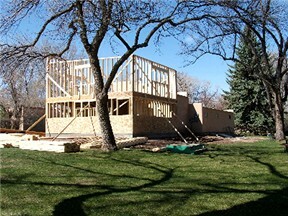 The 2nd floor is taking shape. 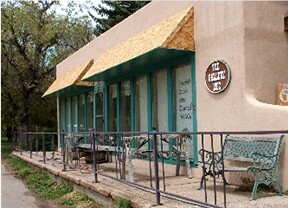 From the Bakery, across the street. 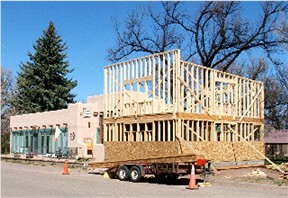 April 21--framing has been done finishing the west wall of the 2nd floor, where it connects to the existing building. 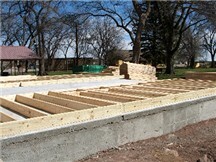 Workers installed supports for the roof and other framing details. 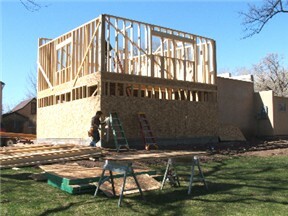 The outside has been enclosed and the crew is finishing framing on the roof April 28. 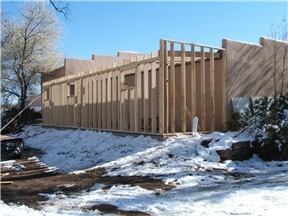 April 29, studs are being installed on the existing stucco wall of the gallery. 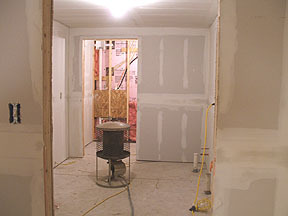 This is a view of where the office will be, under the stairs. 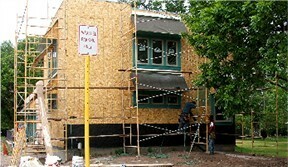 One of contractor Tom Lessar's hardworking construction crew -- the two windows with the framing all around will remain, giving the staff a view between rooms. 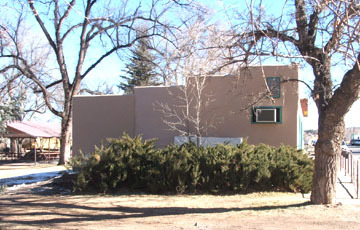 The other two windows will be removed to form an entrance to the new addition. 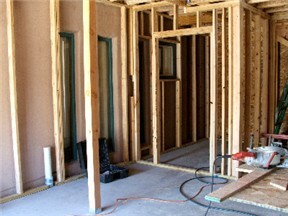 May 2 -- the new office area door is framed in. 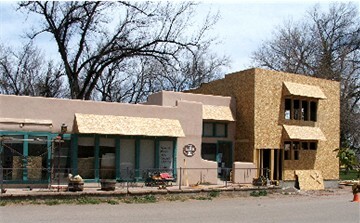 This week the two windows seen here with turquoise trim will be removed to make an entrance between the gift shop and the new addition. 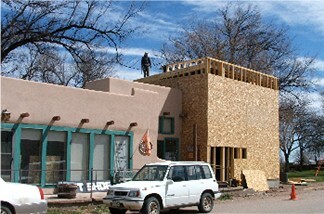 The roofers will be putting the roof on--no pictures of that. 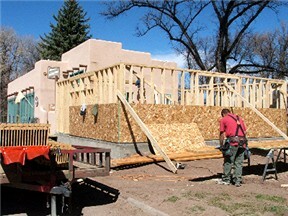 May 3 - today the crew began constructing the framework for the window canopies. 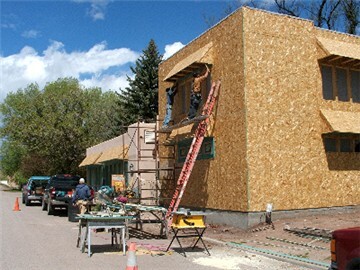 May 4 -- More window openings and canopies. 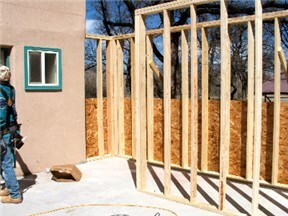 Awaiting delivery of windows. 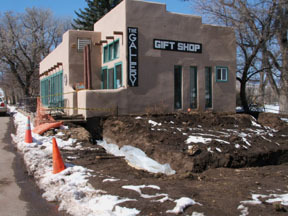 In anticipation of the removal of two of the windows in the gift shop to create the entrance to the new addition, much of the merchandise from the gift shop has been moved. The desk has been moved across the room. 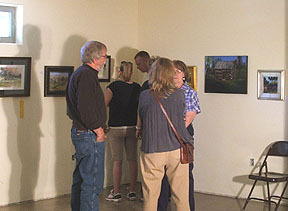 Part of the gift shop has been temporarily incorporated into the Gallery, which was showing artwork of the La Veta High and Jr. High art classes. 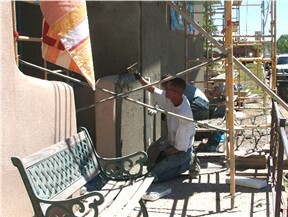 Workers cut out the windows and cement blocks to create the entrance to the new addition, creating a lot of dust! 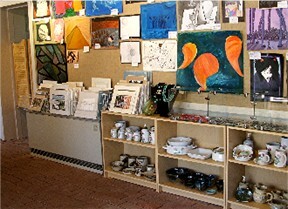 The gallery is still open, but the gift shop artwork is scattered. 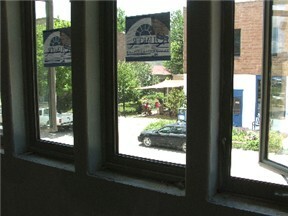 While waiting for the windows to arrive, the crew put new trim on the existing gallery windows. 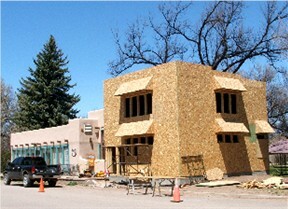 Most of the windows have been installed and the canopies are readied for tile installation--May 20. 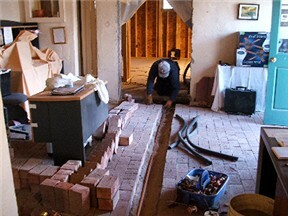 The plumber, from McCoy Plumbing, has lifted bricks in the Gift Shop to install a water line to the upstairs sink. 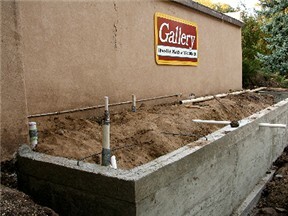 The Gift Shop is in total disarray, but the main Gallery has a fabulous Photography Show on display now. 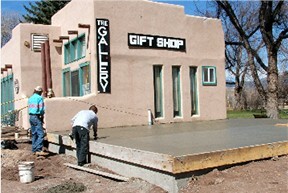 Cindy Thomas and Jacob Korinek of The Edge Concrete Inc. applied the stain to the concrete floor in the new gallery on May 28. 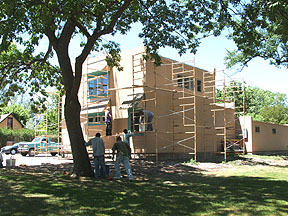 June 3, the insulation was installed. This room is pretty dark, so my picture was blurry. 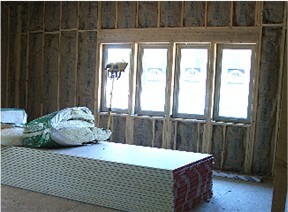 The drywall for the upstairs was brought in and is ready to be fastened to the walls. 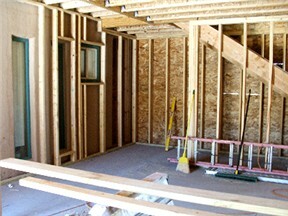 Here is a view of the upstairs workshop area looking toward the windows above the stairs. 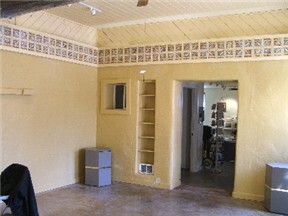 Here is the view from the upstairs workshop area. 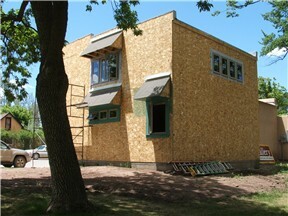 One last shot of the back of the new addition before the stucco is applied. 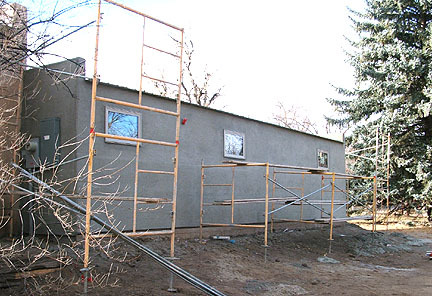 The scaffolds go up for the stucco on the outside. 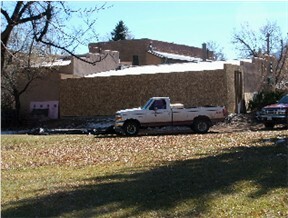 The building is readied for the application of stucco. 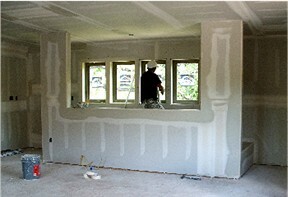 This is a closer view of the stucco going on. 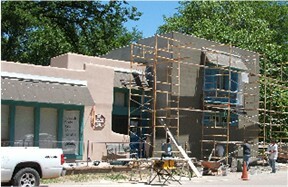 June 22, stucco is applied to the outside of the new addition. 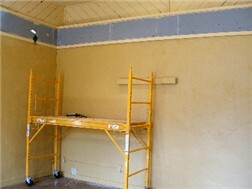 The interior is painted. 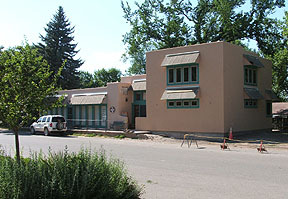 June 23, the stucco is drying. 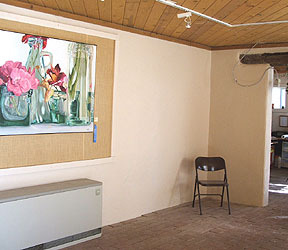 The Plein Air Painting Show was held June 25 in the new John and Jeannie Fuller Gallery, even though it wasn't quite finished. 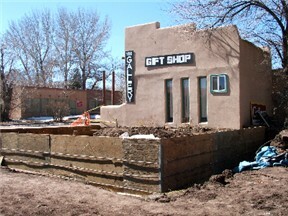 The entrance to from the gift shop into the new gallery has been finished. 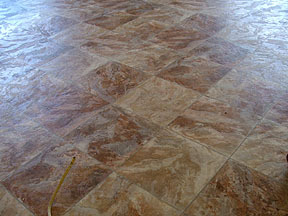 Here is a close up of the new vinyl floor covering in the upstairs workshop, done by Final Step Floors of Walsenburg. 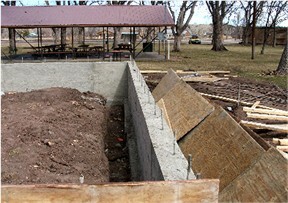 Here is a view of Art in the Park from upstairs in the new addition. 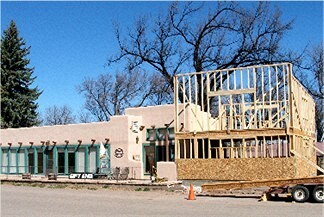 This is what the new addition looked like without the scaffold. 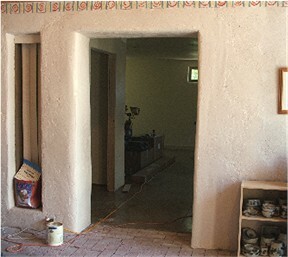 Still to be done is the installation of the Mexican style tiles on the canopies. 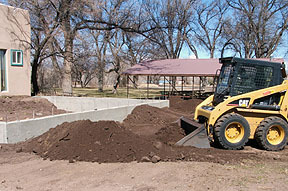 Right after Art in the Park, the new entrance ramp was poured. 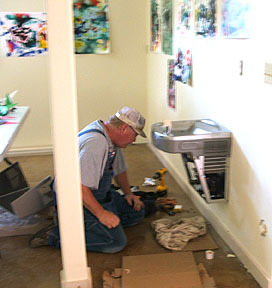 Tom Northup of McCoy Plumbing installed the drinking fountain required by law. 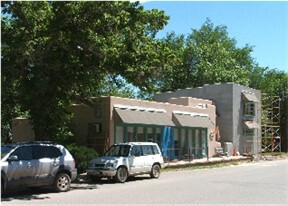 Even as the new gallery is being constructed, it has been put to use twice already: The Plein Air show and the Children's Art Workshop show. 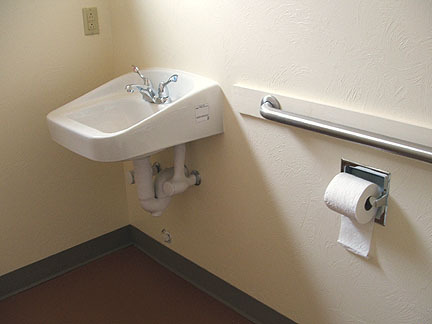 The government requires that we provide a chair lift for handicapped persons. 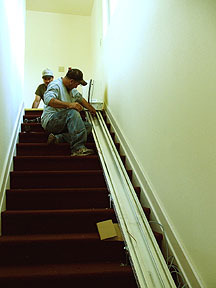 The construction crew also installed a railing on the other side of the stairs. 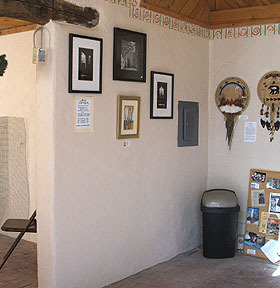 After a break in activity during the winter of 2012, the much anticipated tiles created by Nicole Copel and Polly Harris have been completed and installed in the Gift Shop. 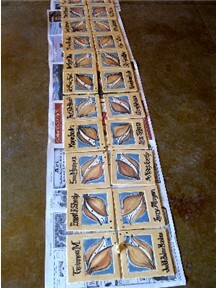 The tiles were carefully organized with the names of the donors, families, and specially recognized individuals . 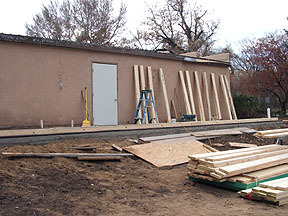 Outdoor landscaping planning is underway, as well as new doors and a new railing for the front of the building. 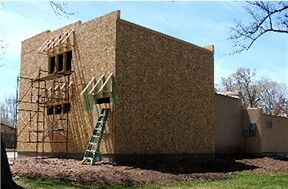 Each tile represents $100 donated by individuals for the SPACe Building Expansion. 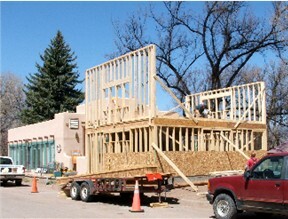 Such a generous outpouring during the economic downturn throughout the entire fundraising process has been phenomenal. THANK YOU !! !